Howard Megal’s campaign to be the next General Manager of the Mets gets a little more real today, and you can play a part in it. Amazin’ Avenue and New York Baseball Digest will be hosting votes for Megdal all week long, so head over and let your voice be heard. If you’re not familiar with Howard or his campaign, check out his website. Then get over to Amazin’ Avenue or NYBD and vote. This is going to be fun, and I can’t wait to see the results at the end of the week. This is so preposterously awesome that I would pay to attend in person: Howard Megdal, persuing his campaign to be elected General Manager of the Mets, has invited former Mets’ GM (and chronic adulterer) Steve Phillips to “a friendly debate over my candidacy for General Manager, your experience as General Manager, and the future direction of the New York Mets”. Howard’s invitation is almost unnecessarily polite. Phillips’ position is clear: most people have no idea what the General Manager’s job entails. On the face of it, I’d suspect that’s true: baseball, like EVERY SINGLE OTHER INDUSTRY, has hidden details which greatly impact success or failure but escape the notice of casual observers. Fair enough. But the tone of Phillips’ post suggests that we aren’t CAPABLE of knowing what a General Manager does, and that’s highly insulting. Just because we’ve never filled out MLB’s version of a TPS report or held countless daily meetings with scouts, coordinators, and evaluators doesn’t mean that we can’t learn how to do so. If we extend Phillips’ asinine logic, ordinary people would be incapable of switching industries, opening up businesses unrelated to their current careers, or running for office. That’s downright un-American, and I’d love to see Howard Megdal that make point clear to him in a debate (though I suspect Howard is to classy to do so). I suspect it’s a moot point: while I applaud Howard’s initiative, I doubt Phillips will accept his invitation. If the man refuses to recognize the greatness of Carlos Beltran on the playing field, I don’t think he’ll want to engage the logic and passion of a long-time Mets fan in a public setting. I hope I’m wrong because I think we’d all benefit from the experience, Phillips included. Howard Megdal officially launched his campaign for the Mets’ GM position today. Here’s a link to video from the event, and here’s the transcript. I suggest you read it: he’s put a lot of thought into this project. I do not run for this position to oppose any man, but rather to propose new policies. I run because I am convinced that the Mets can become an organization governed by Logic, Transparency and Passion, and because I have such strong feelings about what must be done, I feel that I’m obliged to do all that I can. I feel obliged to extend the discussion, so Section 518 will be participating in Howard Megdal’s campaign for GM. This is your opportunity to get in on the ground floor, to ask questions of the candidate or comment on his qualifications for the general managers job. Watch the video, read the transcript, and send me your comments or questions. This is a good opportunity to have fun while making a broader point about the Mets: we deserve a franchise run on Logic, Transparency, and Passion. In my mind, every small step in that direction is a step worth taking. Let’s add our collective voice to Howard’s (and those of the other blogs involved) and make ourselves heard. On Monday, June 14 at 11 AM, Howard Megdal, writer for SNY.tv, MLBTradeRumors.com, New York Baseball Digest, and Poet Laureate of Amazin’ Avenue, will reveal his decision concerning an electoral campaign to become the next General Manager of the New York Mets. Mr. Megdal will make a statement and take questions from the media. The event will begin promptly at 11 AM on the fourth floor of the Marriott Marquis, 1535 Broadway (at 45th Street). At the conclusion of the event, lunch will not be served. 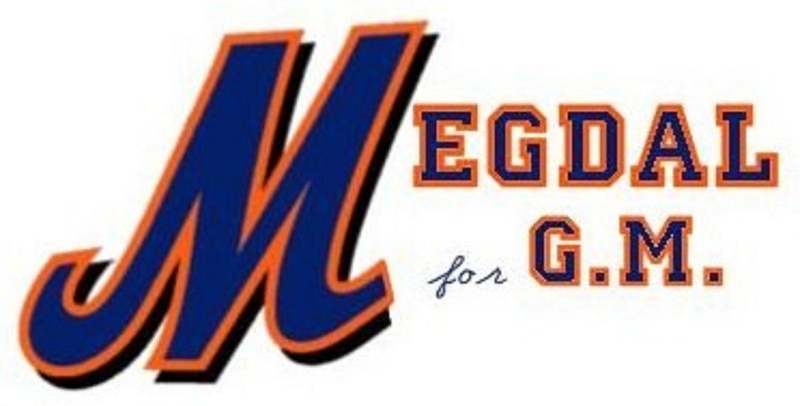 Megdal, 30, would be making his first-ever run for General Manager of the New York Mets. His career-to-date has included a wealth of relevant experience, however, including writing about the team for the New York Observer, authoring a definitive profile of Cowbellman, and finding several different rhyme schemes for the phrase “Big Pelf”. Megdal also understands the fan perspective. He is also a Mets partial season ticket holder, attended David Cone’s 19 strikeout game on October 6, 1991, and served one day as a political prisoner over his love for the New York Mets during Phillies Hat Day at Beck Middle School in Cherry Hill, NJ. I’m excited to see how this plays out. Howard has a lot of energy and I’m sure he has some great ideas and plans, but is his skin thick enough to withstand the withering criticism of the campaign trail? Only time will tell, but if he could successfully withstand the trials and tribulations that come with being a Mets fan deep in Phillies’ territory, I’m sure he’ll do just fine.